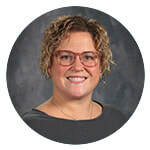 As the school counselor and case manager, Ms. Copland guides students and their families when additional supports are necessary for students to access their grade level curriculum. She also helps students and families with the high school application process. Ms. Copland believes that all students are capable and is passionate about unlocking their abilities and helping them thrive. She loves seeing students experience success after a setback and is committed to supporting each student as an individual. Ms. Copland became a teacher because she herself experienced academic and social struggles in school, which she overcame with the support of caring, knowledgeable teachers. Ms. Copland lives with her husband and two daughters, and her family has rescued two amazing dogs from Wright Way Rescue. They participate in activities that support Wright Way Rescue whenever they can, but mostly they enjoy visiting the facility to snuggle and help care for the dogs.